TCC members meet up in Altafulla. Standing: Juan Pons, Martin Garrido, Pamela Barrus, kneeling: Franesc Borrull; R-standing: Frans Lettenstrom, Jorge Sanchez; kneeling: Emili Xaus, Nicola Coratella. 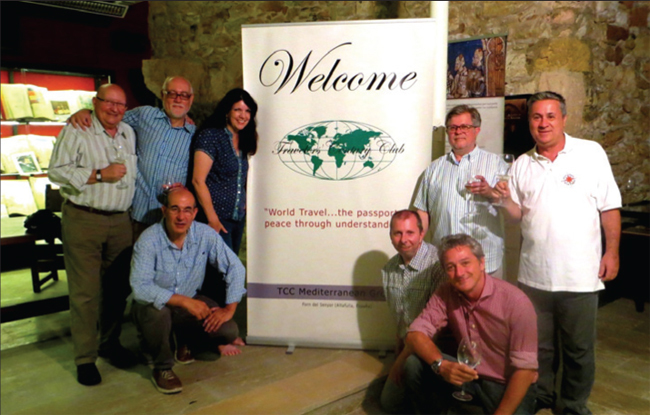 Some of the most enthusiastic members of the TCC reside in Barcelona, and they came together last September in the resort town of Altafulla to talk travel dreams past and future, while dining on Mediterranean seafood and imbibing the superb wine of the Catalan region. Member Martin Garrido often hosts tertulias at his medieval “El Forn del Senyor,” or what once was the community “oven,” an important structure just beneath Altafulla’s castle.